Bid on a 7 Night Stay in a Studio or 1 Bedroom Suite at the Grand Pacific Resorts At Panorama Vacation Retreat At Horsethief Lodge in British Columbia, Canada! Grand Pacific Resorts At Panorama Vacation Retreat At Horsethief Lodge in British Columbia, Canada - Bid on a 7 Night Stay in a Studio or 1 Bedroom Suite! Enjoy 7 Nights in a Studio or 1 Bedroom Suite at the Grand Pacific Resorts At Panorama Vacation Retreat At Horsethief Lodge in British Columbia, Canada! 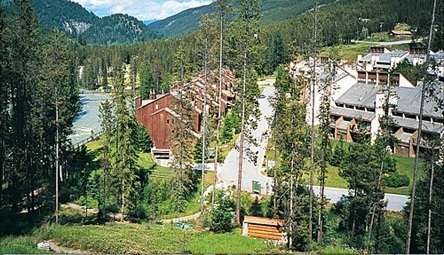 Nestled near the Canadian Rockies, Panorama Resort is rich with rugged natural beauty. Surrounded by creeks, lakes, forests, and mountains, this resort offers almost limitless seasonal outdoor activities. Enjoy on-site downhill, cross-country, and heli-skiing in winter. Warmer weather encourages golfing, tennis, rafting, hiking, and cycling. Special events for the entire family and children's programs are available on a seasonal basis. Enjoy the pool, hot tubs, saunas, masseuse, pub, and seasonally operated restaurants and lounges. In the summer, the Kootenay region offers river rafting, tubing, hiking, golf, mountain biking boat rentals, fishing, horseback riding and more. When the snow begins to fall, enjoy ice skating, downhill and cross-country skiing. Year-round, visit local shops and restaurants as well as the local nightlife for the ultimate Canadian experience. One-Bedroom units sleep up to 4 and include 1 queen bed, 1 sleep sofa and 1 full bath. The queen bed in the studio is a Murphy bed. All units include a fireplace, TV, DVD/VCR, and a full kitchen including a dishwasher and microwave. Please note that there are many stairs leading to and within the units. Your Studio Unit will sleep up to 4 guests and has a full kitchen. OR UPGRADE TO A 1 BEDROOM SUITE FOR ONLY $125 FOR THE WEEK! Your ONE BEDROOM SUITE will sleep up to 4 guests and has a full kitchen. Amenities fee of $10 per unit per day is additional and is collected by the resort at check-in. in order to be the highest bidder. End Date is the date and time that this auction is scheduled to end. All auctions run on Eastern Standard Time. NOTE: For this auction, the end time will be extended by 3 minutes whenever a new bid is submitted within the last 3 minutes of the end of the auction, up to a maximum of 1 hour. The auction closing time will be extended by 3 minutes whenever a new bid is submitted within the last 3 minutes of the end of the auction, up to a maximum of 1 hour. Bid Amount is the current bid amount that you need to place in order to compete in the auction. The Bid Amount will automatically appear as $1 higher than what the current winning bid is. Quantity Desired is the number of units that you would like to bid on. Check the Yes, I Will Accept Lesser Quantity box if you don't mind taking less than the total number of units that you have bid on. For example: If you bid on more than 1 unit, and you are partially outbid (i.e., say you bid $200 for 2 units and someone bids $250 for 1 unit), you will remain an auction winner for some of the units that you bid on, but not all of them. AutoBid lets you set the maximum bid price you are willing to pay for an auction, then automatically increases your bid each time you're outbid, until you reach your maximum bid price. Using this tool is a great way to stay competitive in an auction without having to keep visiting the site to increase your bid price.